In November 2000, Volvo and Ford Motor Company announced their concept car called EyeCar. The EyeCar ensures adequate visibility for all drivers by adjusting the position of the drivers eyes to a standard position within the vehicle via an automated motorized seat. 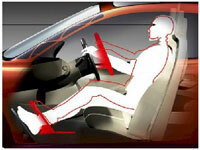 It also adjusts the steering wheel, brake and accelerator pedals to match the drivers position. Volvo uses two different technologies in its "fixed-eye position system" to determine the location of the driver's eye. The first step in determining the position of the eye takes less than a second. It uses a video camera positioned in the interior of the car above the windshield to scan the driver's seat area to find the driver's head and face to pinpoint the location of the driver's eyes and body. Since lighting conditions in the car may vary the camera is equipped with its own infrared light source, a source invisible to the human eye which ensures sufficient lighting for interpretations. After the eyes are identified, the camera registers the reflexes of the eyes and their unique pattern of reflected light. These readings are then compared with pre-programmed patterns by on-board computers which then proceed to adjust the seat, pedals, steering column, handbrake lever and floor to match the optimal height of the seat. to optimize the driver's field of vision. In January, 2001, Volvo expanded its fixed-eye positioning system with its Safety Concept Car's theme of "superior vision." This unique positioning system would be beneficial to our project by providing us knowledge of which area of the windshield is directly in front of each driver.